I mean… It doesn’t REALLY start in May. We’re typically bad at working during the summer. We’re also not REALLY at full strength during the fall…. One of the reasons the (dozens of) readers seem to enjoy this blog is the glimpse they get into our process. To fully understand the Robowrangler build experience, you need to understand what we do to prepare for the build. I’m going to run through some of our pre-season activities. Goal 1 - Give the rookies an introduction to what it means to be a Robowrangler. Get them a chance to learn our values and see our process. Goal 2 - Teach the rookies some basic skills so they’ll be ready to hit the ground running at kickoff. Goal 3 - Give our returning veterans a chance to flex their muscles as leaders now that the seniors have graduated. Goal 4 - Skill growth for all members. Goal 5 - Housekeeping and projects. We designed and built the X016 prototype robot. Since this was a fully functional robot, we brought it to the Robot Remix off-season competition. Our rookies got a chance to pop some rivets, build their first FRC robot, and then see it through a full tournament before their first kickoff. Since the robot took the field, it earned the name: "Bolt"! Sidebar - History of our “X000” series of projects. Robowrangler Design: "Since 2008, everyone who has been on the team has sat through some version of this presentation. Some of your predecessors slept through the same parts you will sleep through." We held our annual “Robowrangler Design” seminars for rookies and interested veterans. These sessions run through the engineering design process, the Robowrangler Design Process, our team goals, our goals for the competition season, and our metrics for success. We talked about THE PACT! This is called Robowrangler Huddle. We "Huddle Up!" for full team discussions all the time and typically start each meeting with a Huddle. I vocally judge the team on their ability to make a "circle". This one was pretty good. 9/10, would huddle again. We did three different design challenges as a team (think “build a paper tower as tall as you can” type activities). Many lessons were learned. Many towers failed spectacularly. In this challenge the goal was to hold a Steamworks gear as high above the field as possible using only the materials I provided (some cups, some floss, tape, paper, plates, etc). This was the mentor group, their tower was impressive but ultimately was too ambitious and didn't win. Is there a parable here? We held shop organization meetings. We spent a lot of time talking about the ways that "This year, we're TOTALLY going to stay organized during the build season. THIS time it's going to be different." We ran a lot of VEX events. Sooo many VEX events. There are a lot of robotics students in the Greenville area. This STEM thing might actually catch on? Bolt wanted to help with the VRC league nights. We ran a whole pile of outreach events and demos. Little kids love robots. 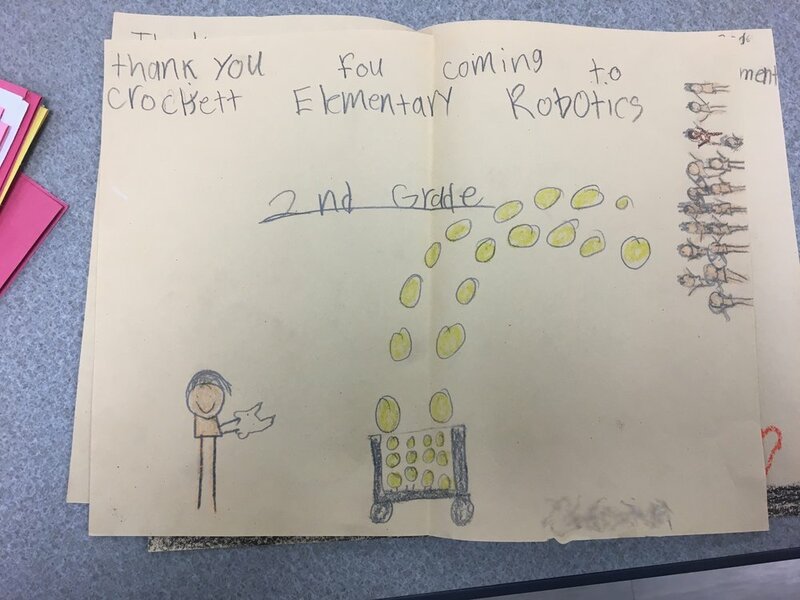 (Then they love the fact that every student in the Greenville district has the opportunity to be on a robotics team starting in Elementary school!) Many of them grow up waiting for the day they'll be able to put on a Robowrangler shirt. Rogue is already proving itself as our best ever demo robot. We held 2 movie nights on the field in the shop. We had a “Team Fun Day” with Go-Karts, Lazer Tag, Bowling, and Video Games at Shenaniganz. I was “Flash”. I present this Lazer Tag final score-card without editorial. We CADed the X017 drivetrain as a design exercise. The X017 design is an evolution of the chain-in-tube, cantilevered-wheel style drive we started using with X009. Note: the lack of 775pro gearboxes. X017 with "Mr. Cinderblock". MCB is an important member of the team so we added him to the Robowrangler CAD library. We went through the 2017 “Robot” rules line-by-line and talked about the major design constraints we face. When we get the 2018 rules at kickoff, we'll review only the major changes. Individual sub-teams will learn the new rules backwards and forwards. We use Slack for team communication, design discussions, and meme sharing. We did all those things in the pre-season, especially meme sharing. Lots of meme sharing. We reviewed our Goal-Map from the 2017 season, and prepared to update it once we get the 2018 rules. We played Ultimate Extreme Robowrangler Dodgeball. This is an important part of the process, which many teams miss. What makes it ultimate and extreme? That is a good question...f you're interested you need to come visit the shop and find out! Bring your A-game.